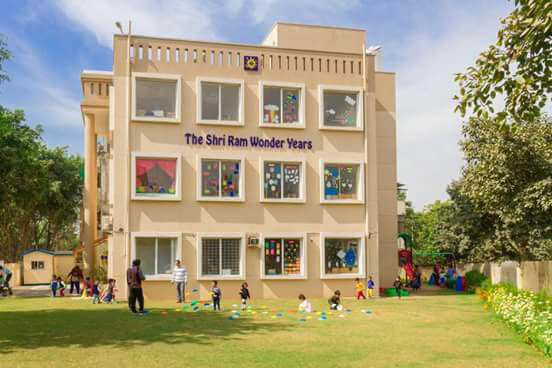 From the moment children walk through the gates of ‘The Shri Ram Wonder Years’ they embark on a journey of discovery. Located in the quiet lanes of Suncity, away from the noise and clutter of the city our school provides a safe and welcoming environment which gives children an opportunity to learn, play, imagine and discover themselves. A warm and welcoming interior with big corridors where the children enjoy walking on a balancing beam and passing through tunnels. Our spacious and well lit classrooms with colourful and vibrant furniture ensure that learning is fun for children. A Library stacked with age appropriate books, a Montessori Room for life skill development gives children a chance to explore and enhance their learnings. In the specially designed ‘Role Play Room’ children play in their enchanting world of make believe! All these activities further develop their imagination, creativity and critical thinking. A well equipped playground for children to play and have fun. A traffic park to enjoy riding bicycles and learning traffic rules. A beautiful lively park for them to relax and be close to the nature. This physical space at TSWY supports the development of their gross motor skills. Our Morning begins with children entering the school with a smile on their face and twinkle in their eyes. They ride bicycles on the Traffic Park, play on swings and slides, jump on the Trampoline and dance to the tunes of Nursery rhymes followed by the hymns of the Morning Assembly. These activities help in peer bonding, strengthen their communication skills and enhance their confidence level. Our well qualified, experienced and sensitized team makes every effort to ensure that the first step to the child’s education is playful, stress free, and full of smiles. TSWY is a Pre-school where learning is experiential and children are an active participant in their own learning.